If you are pregnant or a new mom, there is an exciting new program where you can receive FREE text messages on your cell phone to help you during the pregnancy and the baby’s first year. Remember, it is FREE! Take your baby to the pediatrician or family doctor. Get your baby immunized according to the Virginia Immunization Schedule. Take care of yourself and your baby. Remember proper diet and nutrition for yourself and your baby. Remember the ABC’s of Safe Sleep. Locally, the top 3 reasons babies die before their first birthday are Premature Birth, Positional Asphyxiationand Sudden Infant Death Syndrome (SIDS). Our goal is to increase everyone’s knowledge of the signs and symptoms of preterm labor and the ABC’s of Safe Sleep. Causes of preterm labor: stress, dehydration, smoking, infection, drugs, alcohol, multiple births (twins), and sometimes the cause is unknown. Often, the signs of premature labor are painless! Lie down on your left side for an hour. Keep feeling your stomach for signs of contractions or tightening. Drink two to three large glasses of water or juice. If the signs do not go away or if you have more than 4 contractions in an hour, call your doctor immediately! A – ALONE Babies should not sleep in a bed with the parents or with other children. B – BACK Babies should sleep on their BACKS for naps and at night. C – CRIB Babies should sleep in a safety approved crib. NO clutter, toys or loose bedding! Do not let your baby overheat during sleep. Did you know? Pacifiers can help reduce the risk of SIDS. Shaken Baby Syndrome – Never Shake Your Baby!!! Shaken baby syndrome is a term used to describe the signs and symptoms resulting from violent shaking of an infant and the damage that causes to the infant’s brain. Feed the baby slowly; burp the baby often. Check the baby’s diaper and change it, if needed. Hold the baby against your chest and walk or rock him/her. Take the baby for a ride in a stroller or car (in a car seat). Sing to the baby or play soft music. Be patient. The baby does not hate you or want to ruin your life. 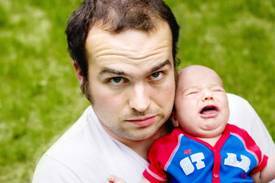 Letting the baby cry it out when you have had enough is safer than shaking or punishing your baby. Virginia Department of Health, Office of Family Health Services – Specific programs provide leadership, expertise and resources for statewide efforts to support women to have healthy pregnancies and to give children a healthy start in life. March of Dimes – March of Dimes is a national nonprofit health organization working to improve the health of babies by preventing birth defects, premature birth, and infant mortality. First Candle – First Candle is a national nonprofit health organization working to advance infant health and survival with a special focus on the prevention of stillbirth, sudden infant death syndrome (SIDS) and other causes of sudden unexpected infant death (SUID). National Center on Shaken Baby Syndrome – The National Center on Shaken Baby Syndrome is a national nonprofit health organization working to educate and train parents and professionals, and to conduct research that will prevent the shaking and abuse of infants in the United States. Shaken Baby Syndrome of Virginia – This Virginia-based nonprofit organization was behind House Bill 411 (Jared’s Law), which requires the Virginia Department of Social Services to make available information about shaken baby syndrome, its effects, and resources for help and support for caretakers.